When watching films based on true events, my propensity for doubting what I see on screen is instantly heightened. The main thing that I found suspect was the extent to which Nixon was constructed as a villain. During the film he is shown to be deceptive, racist, lecherous and a man unashamedly motivated by money. The film does add favourable depth to the character in places, making the viewer pity him in some respects, but generally Nixon doesn’t fare well at all. I don’t know enough about the man to accurately comment on the film’s portrayal of him, however I did find the characterisation somewhat dubious. Furthermore, upon researching the interviews, I read that David Frost’s experience was different to what’s seen in the film. According to his partner Caroline Cushing, he didn’t fret endlessly over his performances with Nixon, he was quite content with each of the interviews. So, like many films ‘inspired by true events’, the film takes liberties with the facts. However this doesn’t matter to the viewer, the artistic licence makes for a great piece of dramatisation. The film is quite a gruelling experience; the pressure in and out of the interviews is intense. For a film that concerns conversations, it is quite remarkable how compelling and uncomfortable it is. The wars of words and mind games are more engrossing than any boxing match in ‘Raging Bull’ or ‘The Fighter’. The film’s chief merit lies in its performances. Martin Sheen sounds and even looks exactly like David Frost, it is quite uncanny. And whilst not meeting the likeliness achieved by Sheen, Frank Langella is equally as captivating as Nixon. Also, Kevin Bacon gives a good, typical Kevin Bacon performance as Jack Brennan, the officious aide to the President. 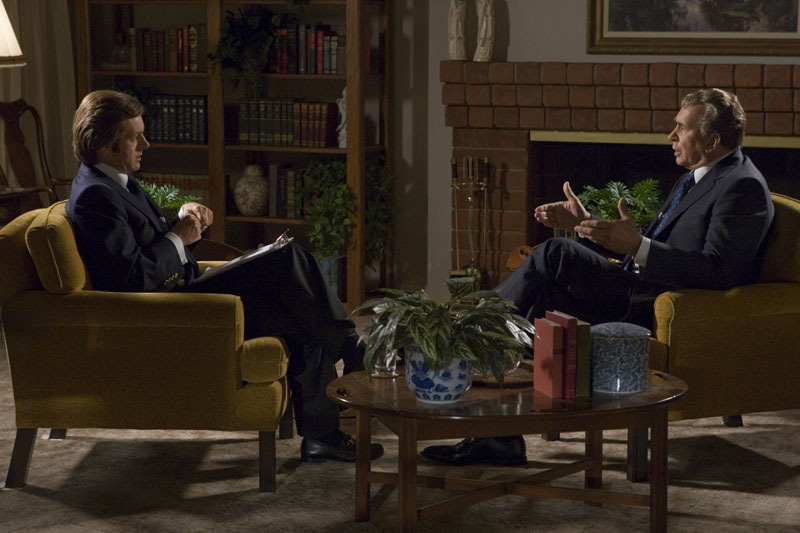 Frost/Nixon is a taut, entertaining dramatisation with strong performances and an accomplished period aura.